Embrace the beauty of autumn with this fabulous collection of carefully selected Marie Clare roses, germinis, hypericum, solidago, and feeling green blossoms. We have even added a crab apple pick for even more colour and to enhance the autumn theme. A fantastic gift for birthdays, home warmings, and any other occasion. 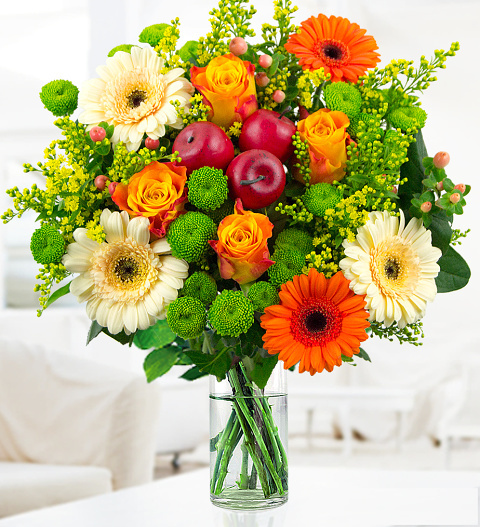 Every stem is carefully selected and lovingly arranged by our professional florists. Available for UK next day delivery, this bunch will brighten even the cloudiest of autumn days! Chocolates may contain nuts.